There variety of Japanese intangible cultural heritages, so in this page, I will introduce you the ones on the list of UNESCO. The history of Nogaku started in Nara era (8th century). Variety of art of public entertainment 'Sangaku' which includes music, song, dance, impersonation, acrobatic and magic came from Asia continent. They were performed under the protection by the government. After the govenment stopped protection in Heian era (9-12th century), the actors dispersed widely and banded togethe and continued their performance. Many of them performed at the festival under the protection by the big temples and shrines or set out on a tour. At this time, 'Sangaku' changed the name to the Japanese one 'Sarugaku (or Sarugo)' and the impersonation became the main performance. AS time passed, the impersonation changed to a satirical comedy mirroring the society, and then it developed to 'Kyogen'. On the other hand, 'Dengaku' which developed from the folk custom of the farm village and 'Jushigei' which developed from the ascetic training of Buddhist Tantrism were often performed and these two entertainments interacted and influenced one another. In mid Kamakura era (13the century) 'Sarugaku' groups authorized by the temples and shrines organized 'Za' and made musical drama. The form of Sarugaku which gives mixed performance of musical drama with story element and comical Kyogen has been followed by the Nogaku of the day. In Nambokucho era (14th century), Yamato Sarugaku and Omi Sarugaku became famous. Especially Yamato Sarugaku gave a birth to the ace performer Kanami. By the support of Shogun Yoshimitsu Ashikaga, Kanami raised Sarugaku to the art by introducing the musical elements. He also encouraged the development by the reformation in music domain combining rythmicl Kyokubu to melodious Kouta. Zeami, the son of Kanami took over the farther's achievement and established the artistic quality of Nogaku which has come down to now. He reacted sensitively to the taste of the audience represented by Shogunin and introducing the advantages of the good performers of the past and of the day. Thus he refined it into the music-based art of 'Yugen (subtle and profound)' which his farther aspired. He made it to the perfect style 'Mugen Noh' in which only the main actor 'Shite' is the center of the choreography, and made a lot of masterpieces. Hi also made variety of literary works about aesthetics, script writing, music composition, singing technic, performance technic, choreography, training, management of the team and so on which were theoritically well-supported. These theories have been succeeded to our days. 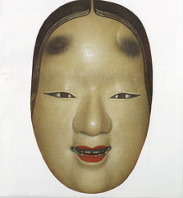 Noh is a musical stage or masque. Constructed of the leading performer Shite and ccompaniment of Jiuta and Hayashi. The most important aspect is that the center of the stage is the dead person. The stage is the world seen by the dead. Main role Shite is normally supernatural beeing such as phantom, hermit or devil, and Waki (side role, human being) listens to Shite's story. Shite always wears a mask, but Waki doesn't wear it. Noh is performed extemporaneously. Noh by the professional is only one stage without careful rehearsal. The rehearsal with all the performers is held only one time without wearing mask and costume. Noh used to be perfomed completely extemporaneously before. Noh express the concept 'Yugen' and 'Myo'. There are several interpretation of these cencepts, but generally 'Yugen' is a beauty aspect and 'Myo' is intangible aspect. The characteristics of the performance is 'Mai'. 'Odori (dance)' the word including vaulting and jumping, onthe contrary 'Mai' is the word to express circular movement. The characteristics of 'Mai' in Noh are 'Suriashi' walk like sliding with your sole on the stage, posture bending the knees and lowering the center of the gravity, and circular movement. Mai is static, no big change of the pace in one song. By tensing the body, they express the rigid line. Emotion is expressed by the body movement and the angle of the head. The mask is made by engraving the wood like cypress. The kind of mask varies like old person, woman (see right photo), man, ghost, animal, Buddha, Okina (God), mask for Kyogen. The same mask can express the both emotions joy and sad by the angle of the head. 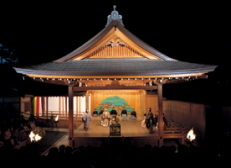 Shiki Sanban has been keeping the styole of Okina Sarugaku which was played before the establishment of Noh. It used be the event in the farm villages to pray for the good harvest. It was called Shiki Sanban (three performances) because three performances (Chichinojo, Okina and Sanban Sarugaku or Sanbanso) were played consecutively. They are also called Okina or Shinka (Song for God). Nowadays, Chichinojo is played and Okina is played by Nogaku actor and Sanbanso is played by Kyogen actor. It does not have a clear story, but like a religious ritual. Old God appears and pray for the peace of the nation and good harvest. In contrast to Noh which tends to be tragic and abstract using mask, Kyogen normally is a realistic comedy which developed from the inpersonation and clownery elements of Sarugaku. They generally don't use masks. The contents of Kyogen are mainly droll like irony or failure story. There are 3 types of Kyogen. 'Betsu Kyogen', the third stage of Shiki Sanban. 'Hon Kyogen' is played independently (this normally is the one when we call Kyogen). 'Ai Kyogen' is played as a part of Noh. The main features of Hon Kyogen are joyfull 'Waki Kyogen', 'Daimyo Kyogen' which feudal lord becomes Shite, 'Shomyo Kyogen' and 'Oniyamabushi Kyogen' which devil or mountain priest becomes Shite.